Hey guys. It's world day at FlashNewz and we've found some obscure international flash sites sure to amaze and perplex. These sites are too weird to not see. I like to think I'm pretty culturally diverse being a Filipino pacific islander born and raised in the States, but these sites are wildin' out due to some serious loss in translation. Knorr foods has a sweet looking paper flipping where you can seemingly mix and match ingredients of some cubed items. And there's a curious iPod of all things sitting on the surface. The iPod seems a bit arbitrary but I can't read the type either. And hey it's cool world food stuff! 100 cheer girl...ok I think this is a work safe site but no emails if it's not! The thumbnail page is the highlight of the site but the content...well you can just see for yourself. It's a page of girls with links to their videos of them doing...things. I watched one of the girls shooting lay ups. Quite poorly I might add. Others are just them sitting there looking at the camera being objectified. Browse if you dare I guess. Last is Agni! Queen of Darkness! An east India-based video gamewhere the heroine runs about with sword and shield complete with her very own...Bollywood music video? Like I said: too weird to miss. 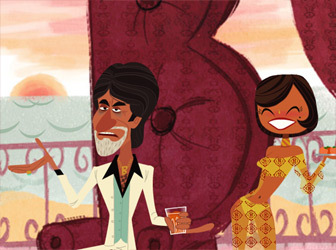 It all kinda worked out this week on Flashnewz because speaking of cultural diversity and Bollywood we've got Brajeshwar and his article covering a really nice animation done by Badmash, an India-based company, that did some fine animation work. Flip the paper! Watch the...iPod? 100 Japanese cheer girls...doing 100 diffrent...things? Indian video game where the heroine has her own Bollywood music video. Badmash is bored. Dont get us wrong. We love us some Bollywood. We couldnt help but getting addicted to MTV Roadies. We even admit to curling up with an episode of Kaun Banega Crorepati every once in a while. Keyur Patel, of Velocity Interactive Group, likes giving birth to new companies. His latest kid is a Badmash, a newly formed pune-based (India) Studio. Sandeep Sood of DoubtSourcing, who thinks brown people are funny, is the head writer at Badmash. Badmash produces original properties and partners with creative people to develop and distribute content. Their contents are expected to be available in a wide range of formats  from your iPhone to your HDTV. Badmash is planning to launch other content properties in the next several months, which includes the launch of music and voting on mobile phones in India and a very cool facebook app.  Badmash is a Hindi (Indian National Language) word synonymous with a crook, a naughty child.